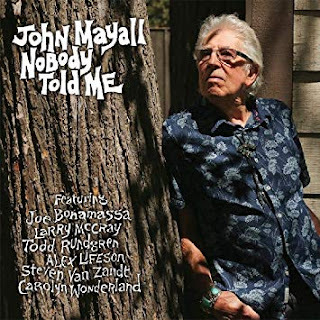 I just had the opportunity to review the most recent release (February 22, 2019), Nobody Told Me, from John Mayall and it's quite good. Opening with Magic Sam's, What Have I Done Wrong, a solid blues rocker, Mayall on lead vocal, keys and harp is joined by Greg Rzab on bass and Jay Davenport on drums and features Joe Bonamassa on guitars. Great opener. Larry McCray joins on The Moon Is Full with blistering guitar riffs over a really hard driving bass line by Rzab. Excellent! Rush veteran, Alex Lifeson joins on Evil And Here To Stay, a lumbering blues track with a healthy dose of Mayall on vocal, harp and piano. Lifeson shows an excellent adaptability from his hard driving rock sound to soulful blues riffs. Very nice. Little Milton's That's What Love Will Make You Do has a funky bass line by Rzab and tune master Todd Rundgren fires off some blistering blues guitar riffs of his own. Gary Moore's, The Hurt Inside, is one of my favorites on the release again with McCray on lead funky hot guitar and some of Mayall's best vocals on the release. Original Boogie track, Like It Like You Do has super vocals and piano by Mayall, a solid bottom and great boogie riffs by Carolyn Wonderland. Very cool. Wrapping the release is another original and title track, Nobody Told Me, a slow blues featuring Mayall way out front on vocal and piano with only the basic of backing and really soulful guitar soloing by Wonderland. This is a super wrapper for a very strong release by a certain father of the modern American blues revival in the 60's.